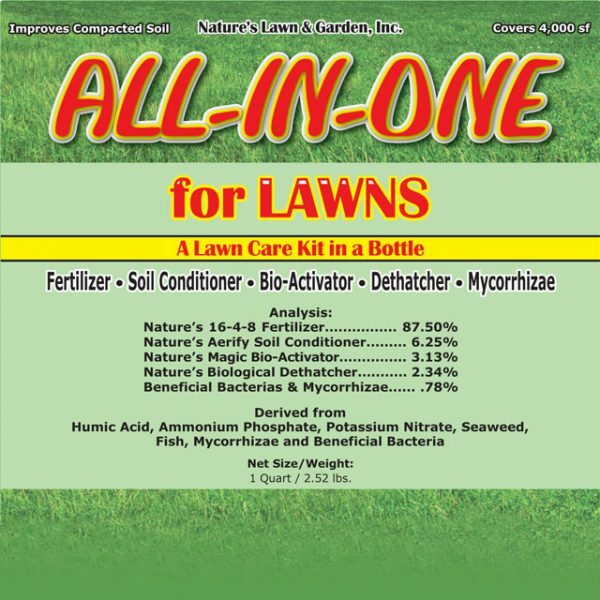 This one product fertilizes, aerates, bio-activates soils and grass, improves organic matter and soil structure, dethatches and improves root development. It is the perfect lawn fertilizer. Instead of making separate applications of 5 products, you can now do it all in one step. 1 Gallon covers 13,000-16,000 sq ft. Simply attach this sprayer to your garden hose and you are ready to go. 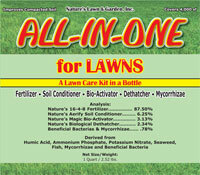 One bottle covers 3-4000 square feet of lawn. When empty, just refill from your gallon or 2 1/2 gallon container. You can also use this sprayer to apply other liquid products. It is preset to spray at 3 oz of product per gallon of water. Click here for the Phosphorus-Free All-In-One if you live in Illinois, Maine, Maryland, Michigan, Minnesota, New Jersey, New York, Vermont, Virginia, Washington, or Wisconsin. All-In-One for LAWNS can be applied with any type of spraying equipment. We suggest using an adjustable hose-end sprayer set at 2-3 oz per gallon of water. Or use our Ready-To-Use Sprayer, which is pre-set for 3 oz per gallon. 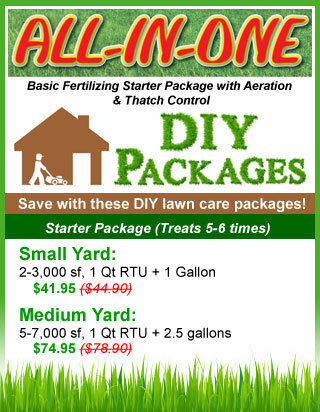 Use 8 oz for every 1000 sf of lawn, or 1 quart for every 4000 sf. For poorer quality lawns or where clippings are not left, apply at 10 oz per 1000 sf. Apply every 4 weeks (or every 2 weeks at half rate) during times of the year when the grass is growing and needs to be mowed regularly. 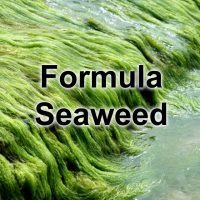 If you are dealing with a heavy clay soil and the grass does not respond quickly or maintain color, apply every 2-3 weeks until better health is achieved. Consider applying additional applications of our Aerify PLUS to help improve the clay faster. Do not apply if grass is under stress from lack of water. 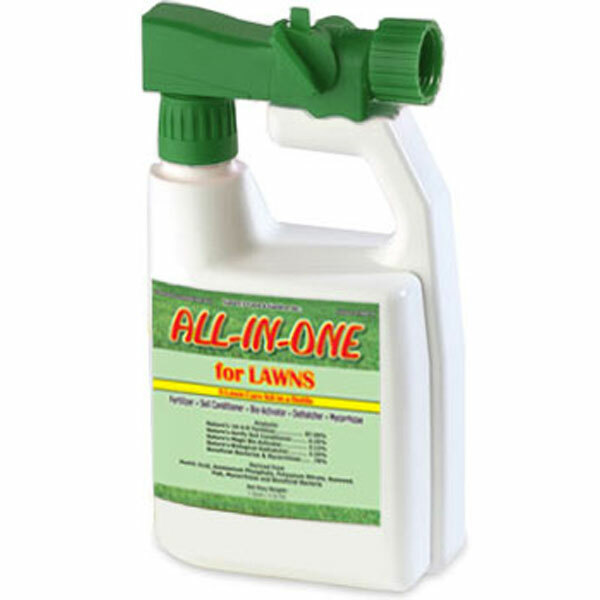 If using a pump or tank sprayer for applications, put in the water first and then add the All-In-One for Lawns. This will help avoid foaming. Commercial users can use a defoamer if necessary. 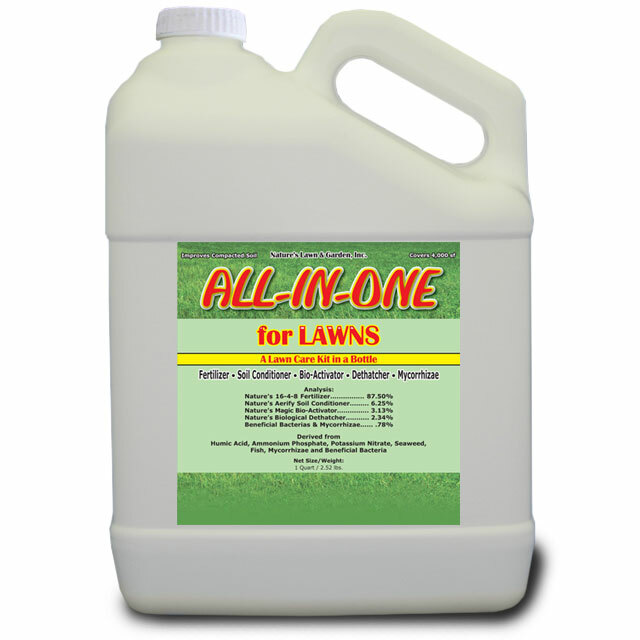 Apply the All-In-One for LAWNS at a concentration of 3-4 oz per gallon of water, but under ideal moist and cool conditions, up to 6 oz per gallon of water can be applied. Use common sense. Any nitrogen fertilizer is capable of dehydrating, or “burning” the grass. I purchased All in One after reading about your various products on your website. My lawn has never looked so wonderful…I don’t know how it could get any better. Great products. My lawn has never looked as healthy since I started using ALL-IN-ONE FOR LAWNS. Using a tank pressure sprayer makes application easy and no more burned spots or surge growth like I used to have with dry granules. Early morning or late afternoon (avoiding daytime heat) applications work best. Determine the size of the lawn (length x width) before applying so you will know how much to use at 8 oz per 1000 sf. Fill your hose-end sprayer with ALL-IN-ONE for LAWNS and if the sprayer is adjustable, set to 2-3 oz per gallon. Turn the water on at a medium flow and walk across the yard at a slow to medium pace, soaking the top of the lawn as you spray in a 6-10′ swath. 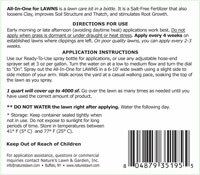 Go over the lawn as many times as needed until you have used the correct amount of the product. With some trial and error you will learn the best pace to apply it just right. DO NOT WATER right after the application. Wait 6-8 hours or until the next day. 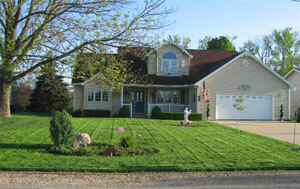 Again, apply every 4 weeks at 8 oz per 1000 sf on established lawns where clippings are left. 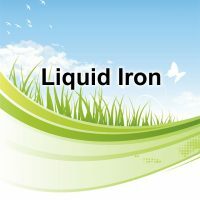 If clippings are not left you may need to apply at 10 oz per 1000 sf to replace the lost nutrients that come from the clippings. 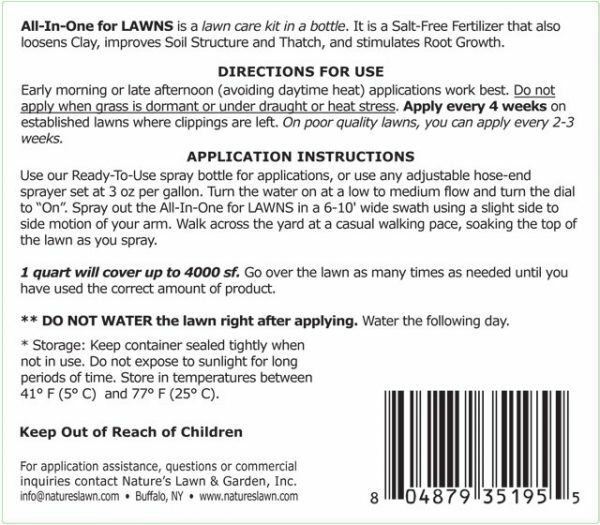 Do not apply when the grass is going dormant or is not growing. On poor quality lawns, or lawns that seem Nitrogen-starved due to pool color, you can apply every 2-3 weeks until better health is achieved. How Much Do You Need for the Whole Season? Though climate, lawn condition, water, geography and even mowing all play a part in how much fertilizer you will need for a whole season, you can use the guideline of ½ gallon of All-In-One for LAWNS for every 1000 sf of lawn at the 8 oz rate. By purchasing in larger sizes you will save money on both the product and the shipping cost per gallon. Any leftover fertilizer can be sealed and stored to be used next season. CLAY SOIL. If you have a real problem with soil compaction or clay, we recommend additional applications of Aerify PLUS to speed up the soil improvement process. SANDY SOIL. Apply regular applications of our Nature’s Magic to your soil help increase water and nutrient holding capacity, to deepen roots, and to improve the Organic Matter content of the soil. THATCH SITUATIONS. If you have a serious problem with Thatch, that should be handled quickly since thatch will bring on all sorts of problems with insects, disease and rooting. We would recommend additional applications of our Biological Dethatcher to correct that situation faster. LIME NEEDED. If your soil is acidic, it would benefit greatly from spring and fall applications of our Liquid Lime Formula.